Keeping in mind that Elize and Alissa had almost no time to prepare for the show, they hit the stage for ‘Storytime’ with lyric sheets in hand. Over the course of the night Elize returned to the sheets of paper as required to help her along. 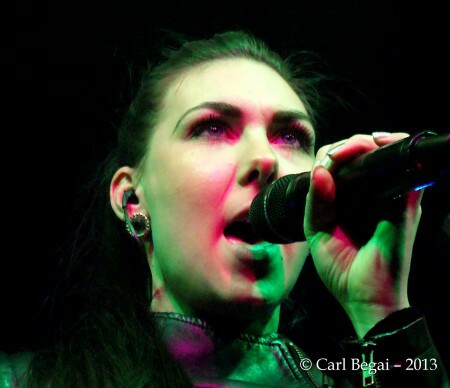 Sure, there were some minor gaffs over the course of the gig, but from a purely personal point of view it was a ballsy move for Elize to even attempt the show, never mind read the lyrics. She deserves huge respect for her performance, and judging by fan reactions online I’m not alone in my thinking. Go to this location for my rant against Olzon’s attitude and my opinion on her firing from Nightwish. Photos by Carl Begai. All rights reserved.